Calgary City Council has approved a bylaw that will require all multi-family complexes (such as condos, apartments, townhouses or any other building or development with five or more units) to offer recycling programs in Calgary. The deadline for Calgary property managers to establish a compliant recycling program is February 1, 2016. All multi-family complexes must provide on-site recycling of materials accepted in single family Blue Cart recycling. This bylaw offers flexibility and choice for property managers, allowing them to decide how to provide on-site recycling, how and where to store materials, and which Calgary recycling company to hire. 310-DUMP offers multi-family waste and recycling programs in Calgary at fair prices with no extra costs. Get a free estimate online today! Get a Free Waste and Recycling Estimate Today! Front load containers (waste bins) are commonly used by commercial and industrial facilities for regular trash pick-up (rather than one-time disposal) and are designed for a more permanent waste management solution. Front load dumpsters are fire resistant, leakproof and available in a variety of sizes, from 2-yard dumpsters (80"w x 40"d x 36"h) to 8-yard dumpsters (80"w x 64"d x 80"h). 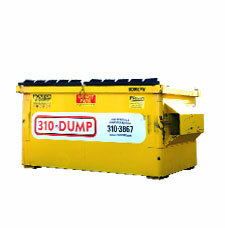 310-DUMP offers a variety of standard flat or sloped top front load dumpsters for commercial businesses (including restaurants, retailers and corporate clients) and industrial users who require regularly scheduled waste & recycling collection services (daily, weekly or monthly). 310-DUMP has a fully-stocked inventory of front load waste & recycling dumpster bins. We offer multiple size options appropriate for your business - give us a call at 310-DUMP (310-3867) or schedule an appointment online. Upon agreement, we'll set your company up with front load waste & recycling dumpster bins and a schedule a pick-up plan. The program can start immediately. You can count on us to have your waste and recycling services done on time and on schedule in Calgary. Establish Your Calgary Recycling Program Today and Receive Your First Month Free! Designed for a more permanent waste management solution, front load containers are commonly used by commercial, industrial, and multi-family facilities for regular trash pick-up, rather than one-time disposal. Front load dumpsters are fire resistant, leakproof and available in a variety of sizes. 310-DUMP offers a variety of standard flat or sloped top front load bins for commercial businesses (including restaurants, retailers and corporate clients) & multi-family property managers who require regularly scheduled waste collection services (daily, weekly or monthly).